At Relay, we build chatbots designed to automate tech support for some of the most popular brick-and-mortar technologies that exist in merchant locations all over the world. We’d like to share some of the chatbot design best practices that we incorporate in our chatbots as we try to craft the perfect chatbot UX. A welcome message is as simple as it sounds. It’s an opportunity for the chatbot to nicely greet the user, set expectations for what it can help the user with, and provide essential tips and instructions for optimal use. Don’t underestimate how much a well crafted welcome message can impact UX and the success of your chatbot design. Just like first impressions shape our future relationships with other humans, the user’s first interaction with a chatbot can make or break the success of their chat session and determine whether or not they will be a repeat user. While the welcome message helps set the tone for the conversation, the failure message helps to atone for a chatbot’s shortcomings. A user’s response should never under any circumstances go unanswered by the chatbot. This is unacceptable from a chatbot design and UX perspective and leaves the user in an awkward state to move forward with the conversation. Imagine if you were having a conversation with another human and they listened to something you said but provided absolutely no response. Unless you have to interact with this person, you’re probably most opt just to walk away and end the conversation. This same feeling could easily resonate with a chatbot’s users. Acknowledge the failure in a remorseful tone. Provide an opportunity for the user to overcome the failure OR extract valuable feedback from the user to help prevent the failure in the future. In the screenshot below you can see how we design some of our failure messages in the Relay chatbots. Don’t bypass this critical aspect of chatbot design. Learn more about how you can best utilize failure messages in your chatbot design. Response buttons provide an excellent opportunity to overcome AI shortcomings and to help guide users to their answer when needed. Add in the fact that it takes less time to click a button than to type out a response, especially on mobile devices, and response buttons are a no-brainer when building a chatbot. Until there is more advancement in the fields of AI, ML, and NLP, it is inevitable that a chatbot is going to fail to respond to a custom message typed by a user correctly. 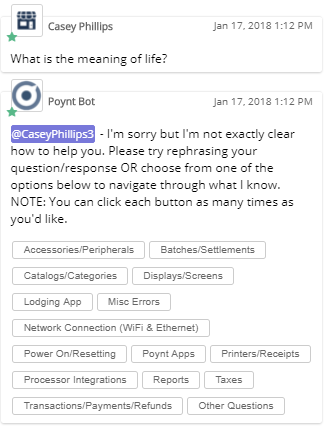 Using response buttons to create clickable menus is an excellent method of guiding end users through the bots knowledge base and the answer they’re ultimately looking for. Learn more about the best practices for incorporating response buttons into your chatbot design. Hint hint: These buttons can even be added to failure messages to help get the user back on the right track with just a single mouse click. Rating buttons allow users to let a chatbot know whether or not it’s performing up to par. These can be as simple as thumbs up and thumbs down buttons for the user to click. Whatever method is employed, it is best to keep the process of rating chatbots passive to not directly interrupt the conversation. Bonus points for incorporating a failure message to get feedback from the user when a dissatisfied rating occurs. This a subtle yet powerful feature that should be incorporated in some manner in all chatbot design. 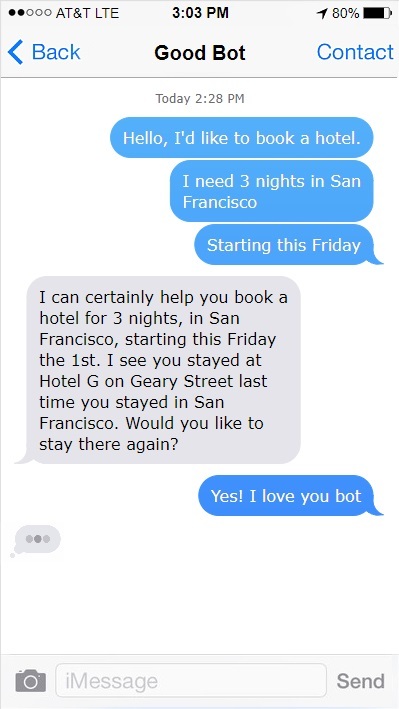 Typing indicators allow a chatbot to interact with a user in a more natural conversation. For the iOS users out there imagine having an iMessage conversation with another iOS user. Typing indicators let you know that the other person is in the process of typing out a new response and are essential to good chatbot design. Based on this information you may hold off on responding yourself again until you receive this response in progress. This same logic holds true in most chatbot conversations. If a chatbot needs to send multiple responses to a user, it is ideal for the chatbot to wait momentarily in between messages with the typing indicator present. This resembles a more natural conversation than having the chatbot respond immediately with multiple messages. If a chatbot is going to pause in between messages it is crucial that a typing indicator is in use; otherwise, the user may think the chatbot is not working and begin uttering unpleasantries in the chatroom. That poor chatbot… If you’d like, feel free to learn more about typing indicators and the concept of intelligent listening in chatbot design. Avatars help to create a more friendly feel for the conversation and give the chatbot a bit of a persona. 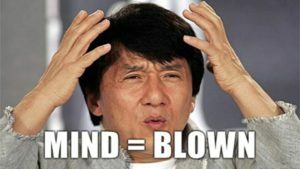 Depending on the context of a chatbot’s use this concept can even be taken a step further by enhancing this persona by providing the chatbot with a unique voice. While this may not be appropriate for all chatbot design cases, mixing in a little humor with the chatbot UX can yield a subtle boost without requiring one to roll up their sleeves. 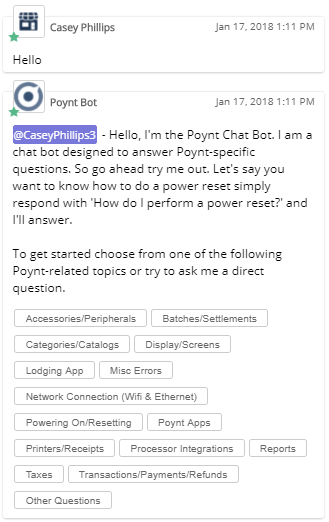 Have you used the Relay chatbots yet? If not, we’d love to show you a demo and prove just how valuable they can be to your support team. If you have used our chatbots already, we’d gladly welcome any feedback you may have whether it’s regarding our chatbot design or anything else. You can also watch the video below to get a better feel for how our chatbots interact. Get it delivered to your inbox for free. Each month we send one email with our most popular articles. We won’t spam you, we’re just trying to make it easy to get our best content.